This is a very attractive small shrub, and what Syringa protolaciniata Kabul (syn. 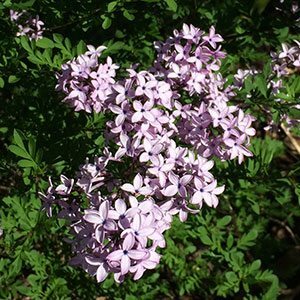 Syringa afghanica) lacks in size it makes up for with flowers and fragrance. The flowers appear in mid to late spring and cover the plant in attractive panicles of violet purple to mauve flowers. This is a deciduous plant that could be grown as a feature plant in the garden, or as an informal hedge. Best is a humus rich well drained soil. A sunny position with a little afternoon shade wis ideal. It is both frost and drought tolerant once established. In very dry springs or summer seasons, the occasional deep watering will be beneficial. In a good garden soil little fertiliser will be required. A little general purpose slow release fertiliser once a year, along with a good mulch around the plant and this wonderful little lilac is very happy. Growth rate – Moderate to fast depending on conditions. Foliage – Green pinnate, deeply cut or ferny foliage.